This week has been one of firsts! 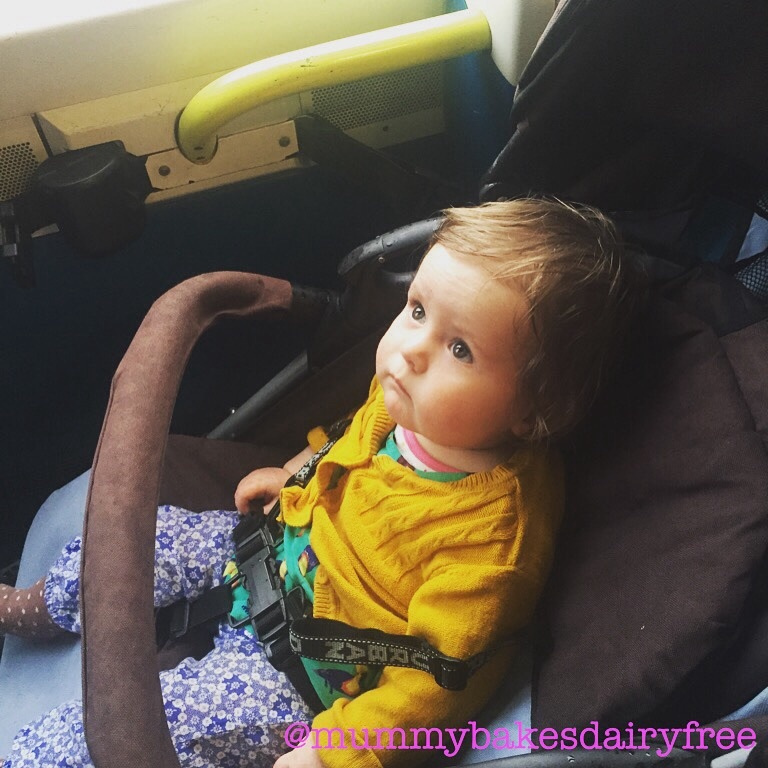 Thursday was our first appointment with the dietitian, which saw Friday being our first try of the soya ladder. On Saturday little one went swimming for the first time and on Sunday we went to our first Allergy and Free From Show by train, another first for little one. The appointment with the dietitian was fairly successful. With little one still being on a couple of bottles of formula (Nutramigen) the dietitian felt that it would be a good idea to introduce soya milk as a replacement. Although little one is under the care of a dermatologist, the dietitian mentioned that it maybe the formula which is causing regular eczema flare ups and generally itchy skin. Therefore, rather than introducing soya milk straight out as a replacement for formula, we have been advised to start the soya ladder. As little one has a little soya in her bread everyday we (under advisement) started on rung six- 1 tsp of custard made with soya milk. We have only done a couple of days as her skin flared up again and we had a very restless night but that may be down to the heat. I think we shall wait till it cools down a little before we try again. 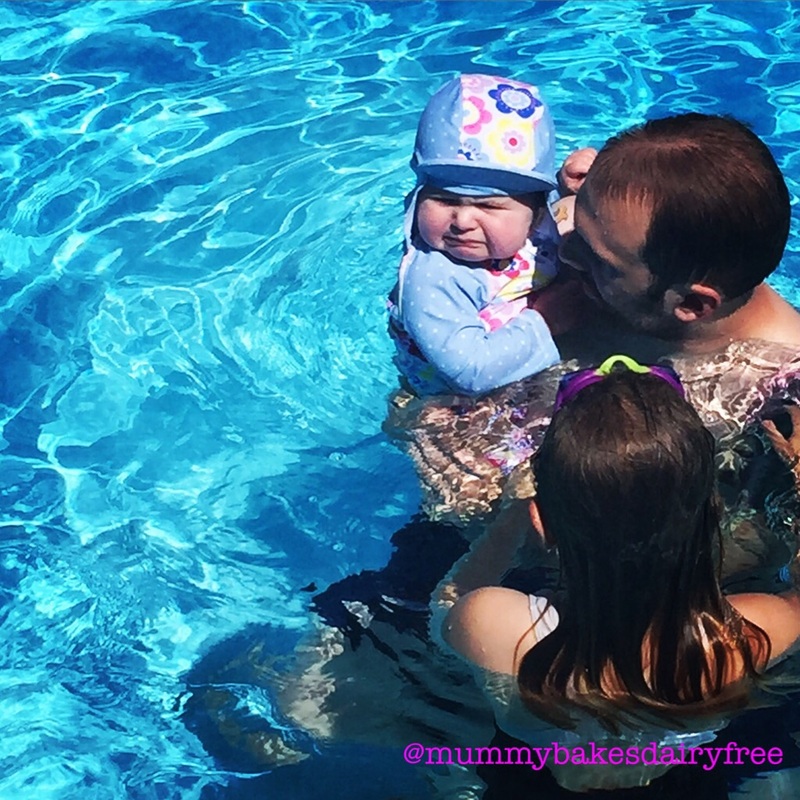 Saturday was little one’s first experience of going swimming. She truly loves the bath so we thought she would really enjoy swimming… she did not! When I was pregnant we had always said that we would take little one swimming when she was a couple of months old. However as little one’s skin has always been pretty dry we never felt it was a good time. We visited little one’s great grandparents for a BBQ and to introduce her to their swimming pool. She loved the BBQ, demolishing a sausage and a half but wasn’t so keen on being in the water. On Sunday little one and I went with her Nanna to visit the Allergy and Free From show in Kensington Olympia. We went by train which was very exciting for little one as it was her first time! She is a very nosy child and loves people watching so a train journey was ideal! 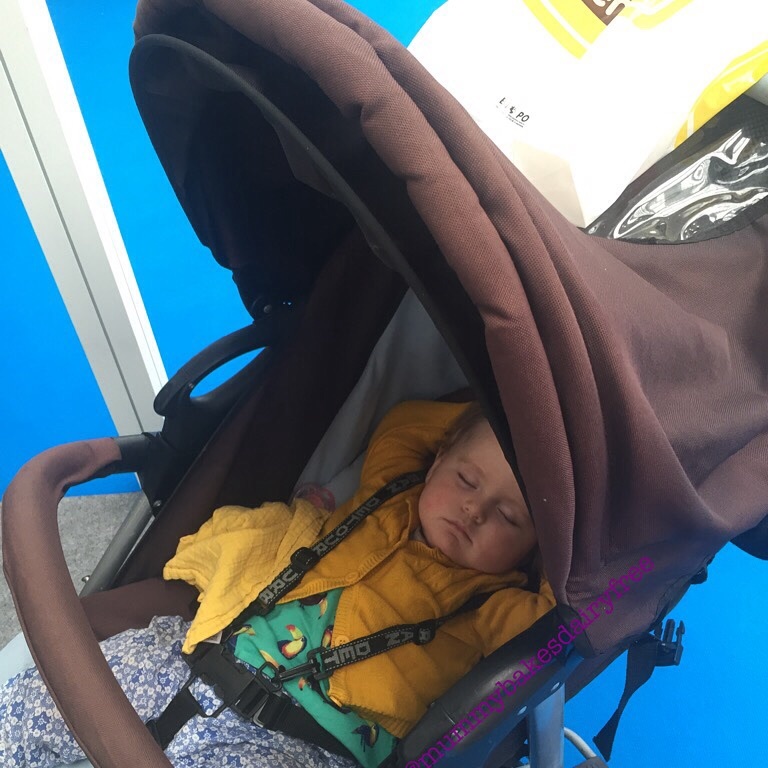 Little one was flaked out in her pushchair when we arrived at the show and that is how she stayed for two thirds of it. This gave her Nanna and I a perfect chance to check out all the different stands and sample the free from goods on offer. 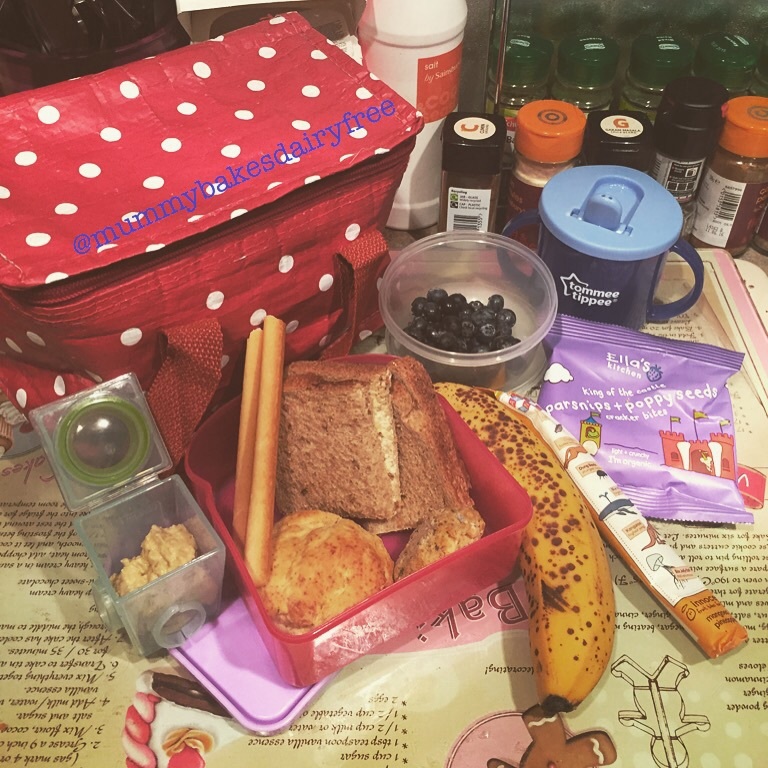 It is fair to say that I’m glad I only packed little one a lunch as I filled up on lots of delicious samples! We visited Twitter friends which was great as I can put faces to tweets now! Everyone was very friendly and helpful, so I have lots of new products to seek out in local health food shops or online. Allergy Adventures had some great activity packs and books for the children. I bought little one a book about a nut-free adventure to the seaside. She’s a little young for it yet but I can’t wait to share it with her when she’s a little older. We also got some fab allergy aware stickers! Bute Island Foods- Creamy Sheese dairy free ‘cheese’ tasted amazing, definitely one of the best dairy free soft cheeses that I’ve tasted. It does contain soya so I have bought it hoping little one can tolerate soya before it expires in January 2016. If it not I will be happy to enjoy the garlic and herb creamy Sheese on crackers! They also had hard cheeses in different flavours and melts cheeses which would be great for sauces or on toast! Doherty Meats were very popular! Their stand smelt fantastic and they had hot sausages to try! 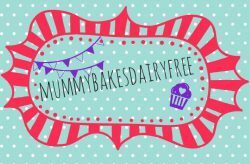 Their sausages are gluten, egg and dairy free and little one enjoyed them very much. She was still munching on the samples on the way home. They are stocked in some supermarkets so I am going to investigate more! Fria Gluten Free had some delicious baked goods. Their Swedish Brownie Cake (contains egg and gluten free wheat starch) and Grova brown sliced loaf (contains gluten free wheat starch) were lovely and milk free! I definitely think that I will look out for them in independent health shops. 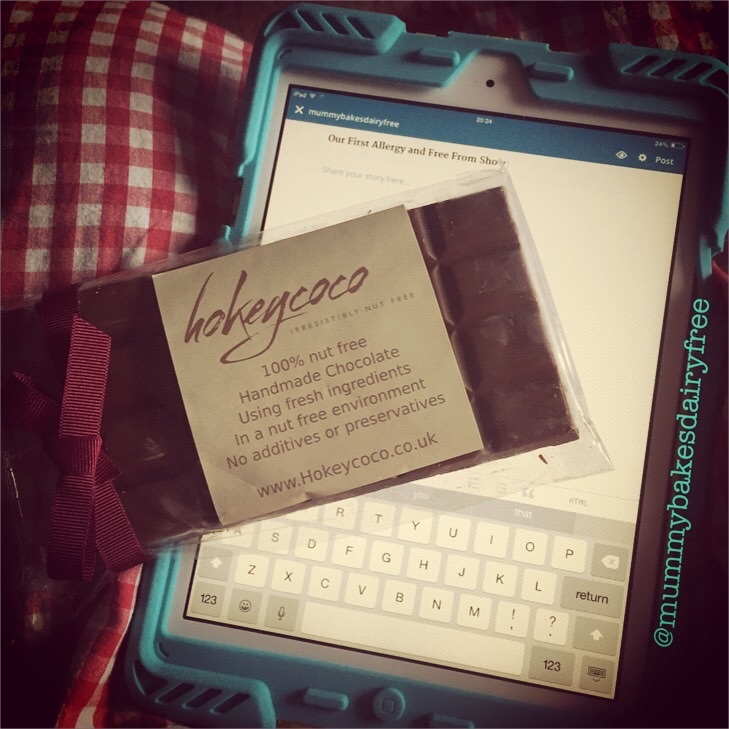 Hokeycoco nut free chocolates are gorgeous! I’m currently enjoying a bar of milk chocolate and sea salt. Such a lovely combination! Now it’s not dairy or soya free but it was a purchase intended for my husband, little one’s daddy. He is reluctantly sharing it with me! Beautifully packaged, I will be definitely checking out their website for a treat soon. They had white, milk and dark chocolate in different formats as well as chocolate boxes. Jollyum were giving out scrummy samples of their dairy and gluten free ice creams. Made using organic soya milk, I thoroughly enjoyed their Passion Fruit and Chocolate flavour. I’m going to make sure our local health food shop starting stocking these soon! Pudology had dairy and gluten free chilled desserts using coconut milk and some use soya. They’re stocked in some of the main supermarkets so I can see these being a yummy treat for little one when she is older (or a yummy treat for me now). My favourite was their Chocolate Pud, however they had other flavours to offer, such as a banoffee pudding, yum! 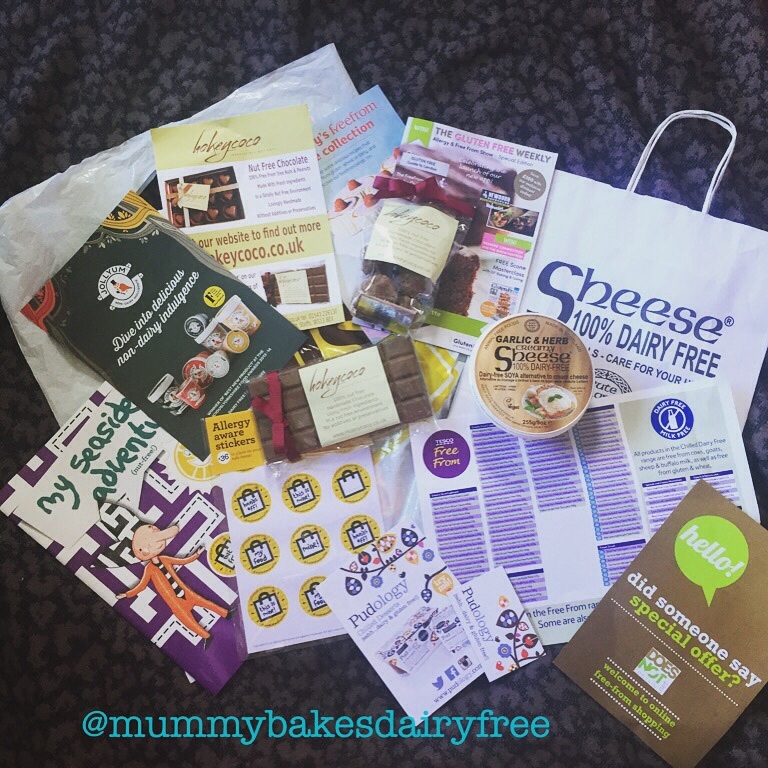 The Tesco Free From stand were offering samples of lots of their products however their list of dairy and gluten free products was much more useful. I was surprised by the range that they had on sale. We had such a great day and everyone was genuinely very helpful and friendly. I have only mentioned a handful of the stands we visited as they were most relevant to us. Any products I have commented on were purchased by me. As I was writing this we also had another first… little one took her first steps with her push along walker! She really is growing up too fast!